Like my previous post, this one is also a little late in getting on-line, but for the record, here it is. In November, I traveled to Okinawa, Japan together with some of my colleagues from the Center for English Language Education (CELESE) in Waseda University Faculty of Science and Engineering in order to conduct and present in a symposium at the Japan Association for Educational Psychology (JAEP). The title of our symposium was "Important issues concerning the communication skills development of students in higher education". We focused on four somewhat disparate, but not unrelated topics. Emmanuel Manalo, the symposium leader, talked about students' use of diagrams during note-taking in order to comprehend the subject matter better; Chris Sheppard looked at factors influencing the failure rate in university level English courses; Fusa Katada considered how universities in Japan are prepared to deal with students with learning disabilities; and I talked about fluency development based on results from the Corpus of Hesitation Phenomena (pilot). 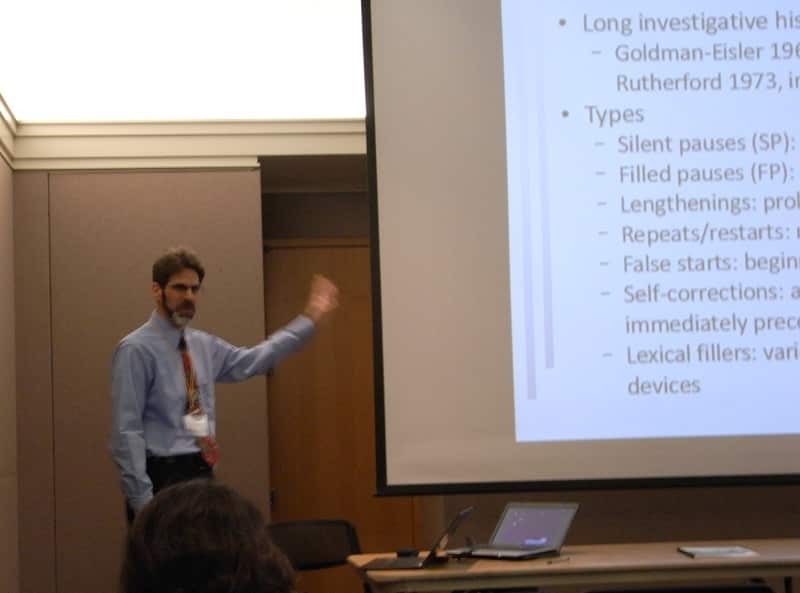 Although the content of my talk was similar to that I presented a few weeks earlier at SLRF in Pittsburgh, I emphasized some results from the corpus which suggests that certain aspects of a learner's first language speech characteristics (especially speech rate), can be used to estimate their second language aptitude. This message is a little late in getting on-line, but for the record, at least, I'll still upload it. In October I was very busy as I made two conference trips in succession. 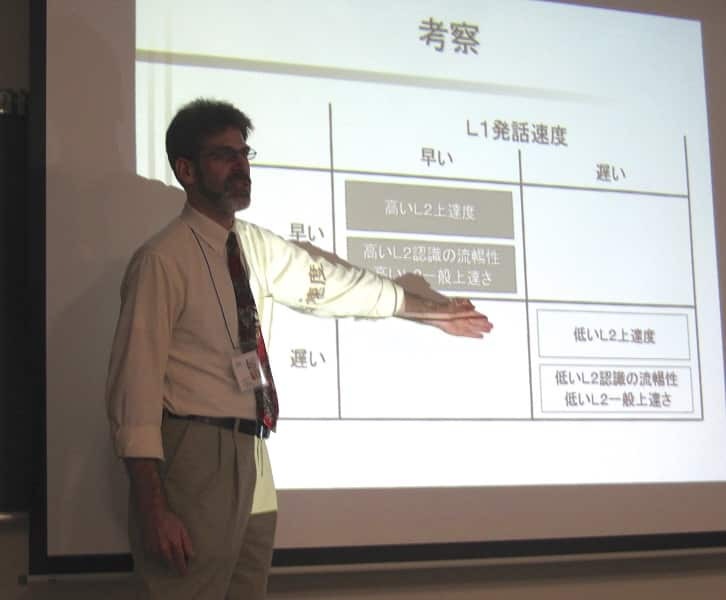 First, I traveled to Hamamatsu here in Japan where I presented at the Japan Association for Language Teaching (JALT) International Conference. After returning back home to Tokyo for one day, I then traveled to Pittsburgh to Carnegie-Mellon University where I participated in the Second Language Research Forum (SLRF). I made a similar presentation at both conferences, though I emphasized the pedagocial implications at the JALT conference. In particular, I noted how results based on the Corpus of Hesitation Phenomena (pilot version) show that Nation's (1989) 4/3/2 fluency exercise technique can be connected to an increase in perceived fluency. The crosslinguistic corpus of hesitation phenomena pilot project was a small-scale corpus collected and analyzed in order to test the validity and potential usefulness of the design for a larger-scale corpus project. The defining feature of the corpus is its crosslinguistic design. Many studies of second language speech have analyzed the second language speech of language learners, some of them even across several competency levels. However, very few included first language speech in order to establish a base-line speech pattern for each participant. The Corpus of Hesitation Phenomena is a corpus of speech which has been transcribed and annotated for various speech features, most notably types of hesitation phenomena (e.g., silent pauses, filled pauses, repairs). The corpus is actually a family of three corpora, as follows.